* 100 g ikan bilis (heads removed), rinsed and drained well. * Mix tamarind with water then strain over fine sieve, discard pulp. * Heat 2 tbs of oil over medium fire, stir fry peanuts till golden. * Remove and drain on paper towels. * In the same pan, add oil for deep frying. Heat oil over high fire and deep fry ikan bilis till crispy. Drain ikan bilis on paper towel. * Discard oil from the pan. * Using a clean pan and new oil for saute, heat 2 tbs of oil and fry spice paste for two minutes. * Add half the coconut milk and fry another 2 minutes until fragrant. * Add tamarind extract, sugar and salt. * Lower fire and simmer until thicken, about 2 more minutes. * Add ikan bilis and peanuts to the sambal paste. Stir to mix well. 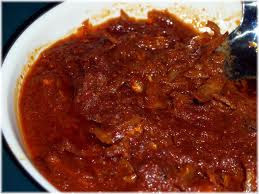 The sambal recipe of ikan bilis is ready to serve..hot ~! !